Our Fall 2014 edition of Swan View’s News describes our recent accomplishments and continuing challenges in protecting wildlife, wilderness and people! 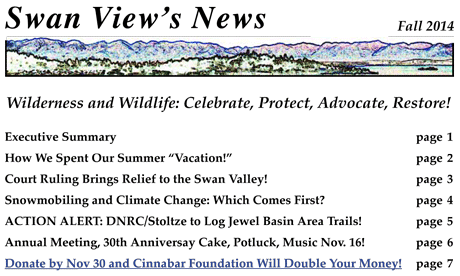 It includes news of our recent lawsuit victory in the Swan Valley, calculates the carbon footprint of snowmobiling, asks you to write a quick note to keep DNRC and Stoltze Lumber from logging the Broken Leg and Crater Notch Trails, and announces our 30th Anniversay membership meeting for November 16th! Remember to support our work by Nov 30 and Cinnabar Foundation will match your donation, doubling your money! Click here to view or download our Fall 2014 newsletter. Please DONATE NOW to support the critical work described in our newsletter!